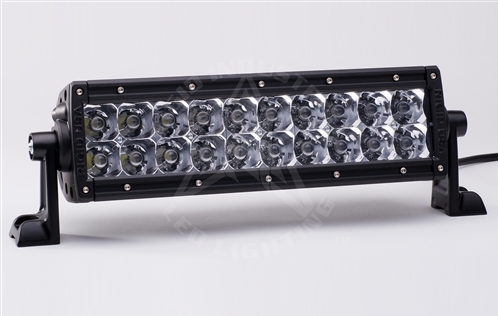 Rigid Industries is the original pioneer of the Forward Projecting LED Lightbars. E Series continues to push the envelope with its superior optics and unmatched efficiency. E Series uses Rigid's patented hybrid reflector system, which gives them the brightest, most efficient LED light on the market. Having the greatest lumen output per watt available on the market is why E Series is the leader in LED lighting solutions. •Operating Temp: -40 ~ + 145 degrees F.
•Patented Hybrid Technology runs lights at 90%, efficiency which is unmatched in the industry. Why LED? A light-emitting-diode (LED) is a semiconductor diode that emits light when an electrical current is applied in the forward direction of the device, as in the simple LED circut. The effect is a form of electroluminescence where incoherent and narow-spectrum light is emitted from the P-N junction in a solid state material. •Rigid Industries Advantage - it's all in the reflector.